Every true survivalist should have at least one pocket knife always ready and perfectly maintained in order to provide the best results. This knife is not only meant for cutting, but it is in general a great tool that can help you with a lot of things – and even with building your emergency camp, hunting, fishing and defense if and when necessary in the worst case scenarios. 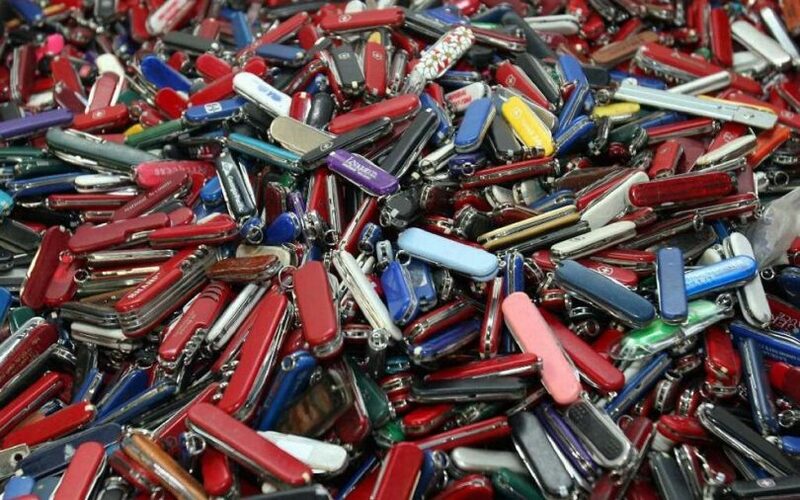 Basically the best thing about pocket knives is that you can always have one around with you, so you are always prepared – pocket knives take little storage space and are thus very practical. Although it is not as difficult to have it maintained to last long and give the best results, we will also add a couple of tips on that subject as well. So, to start off, here is what you need to know on how to choose, clean, and properly use the best pocket knife. Usually when a knife that fits your pocket is mentioned, we think of a multi tool with a blade and tons of other accessories that may probably come in handy in many circumstances. There is nothing wrong about carrying a multi tool – well, except one thing: the blade of the knife that comes with the multi tool. The blade built into a multi tool is usually very thin or not thick enough for the knife to be of great use in any circumstances. That is because multi tools are built with a dozen of other accessories and, because it is made to fit a pocket, multi tools are fairly small. That means that the blade in the multi tool has les space available, thus being made to be thinner than blades used for pocket knives. There is nothing wrong with having a multi tool as many of available tools are more than handy, but if you want to have a pocket knife you can trust in, it is better to have a separate device carried with the multi tool. The blade of a pocket knife is usually made of more quality steel that will last much longer and as it is thicker than the blade in multi tools, it is consequently stronger. That is why we suggest you have a separate pocket knife along with your multi tool. These knives are meant to be carried in your pocket (well, of course!). What makes it secure and safe to be carried around in your pocket without falling out and being lost without you realizing it, is a clip that comes with some or many models. 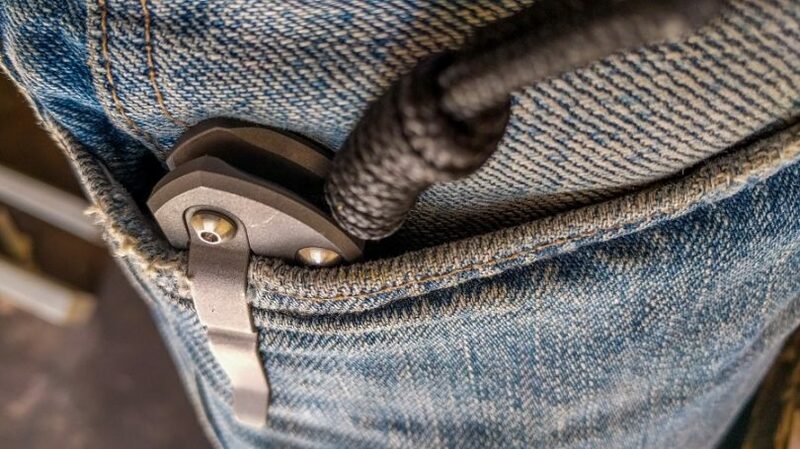 The clip will allow you to attach the bottom of your knife to the edge of your pocket, securing it that way. If you really like your small knife, although it doesn’t come with a clip, you will need to carry it in a deeper pocket to avoid losing it. However be careful as carrying certain knives with you all the time is illegal and it is not recommended. 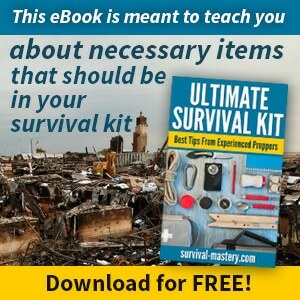 We recommend that you always have your pocket knife with you in radical SHTF scenarios or when you are outdoors camping. A good pocket knife can save your life in many ways. Besides from having to decide the way you are going to carry your knife in order to have it secured, safe and always at your hand, you also need to decide whether you feel more comfortable using locking or non-locking blades. Locking feature will always come with big extra sharp (not to say dangerous) knives, while smaller pocket knives are more likely to come without this option. Locking option actually makes a pocket knife safer to use as you will be able to prevent accidental cuts while using or opening your knife. Non-locking pocket knives also make a good choice for that matter, but it is far safer to use locking blades for heavy duty cutting. If you are only slicing your lunch while enjoying outdoors, non-locking blades will do a good job. Carrying a pocket knife is somewhat illegal, especially when it comes to the size of your blade. If you are planning on using your small knife in special survival occasions, that shouldn’t be a problem. Let’s say that this is a scenario where laws don’t matter anymore. But in the current scenario you need to pay attention to the length of your knife’s blade. You can check the state law regulations in your country of residence and pick the knife’s length in accordance with regulations to make it legal. The longer the blade is – the better, as cutting comes as faster and more effective and efficient. Still, you need to watch for the law and pick the size of your blade in accordance with it. There are several things you need to pay attention to if you want to get the best knife that will suit your needs. This is where you start: analyzing your needs. 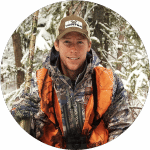 You will look for the knife that suits your intentions, so you are choosing the product after you think through on the topic of whether you need it for fishing, cutting, hunting, emergency situations, and so on. An eye with no or little experience will tell you that it doesn’t matter which blade you go for as long as it is made of steel and sharp – it is important to have it made out of quality materials and well sharpen, but you need to look for a suitable type of blade as well. Once you find a suitable blade, you need to check its features, looking into specifics such as non-locking and locking ability, clipping and size. The size is best to be chosen in accordance with your state regulations, although longer blades are better. At last you need to make sure that your knife is easy to handle and maintain, as well as have it made with high quality materials. Stainless steel is always the best choice when it comes to blades as you will have yourself a long lasting sharp friend in need. You need to pay attention to the handle as well – it is somewhat important to have it made out of materials that will make holding and using such a knife comfy and effortless. Strong rubber or high quality plastic made to be ergonomic would make a great choice. Maintaining such a knife is basically about cleaning it – often and thoroughly. You are not only cleaning your knife so you could have it all sparkly and shiny, but you are primarily cleaning it to make it more efficient and long-lasting. Every time you use your knife, the blade should be cleansed with a wet cloth then rubbed with a dry cloth to remove the remaining of grime, dirt and dust. On long tracks, you should be cleaning your knife with soap, hot water and a toothbrush in order to make every inch of it sparkly and clean. That way you are preventing it from rusting and decaying as some parts of a pocket knife can be easily broken if not taken care of. To add an extra touch to maintaining your knife, you should definitely make sure you have a proper lubricant. Lubricant will protect the product from dust and grime and it will help it obtain its functionality. The functionality of such a knife lies in its opening mechanism and in the sharpness of its blade. Make sure you lube it after you have it cleansed with soap, water and toothbrush. Dry it off afterwards and apply a lube of your choice. We also recommend lubing the blade with edible oil when handling food to prevent crumbs for sticking to your blade longer than it should. Whenever you notice that your knife is losing its sharpness, get a sharpening tool of your choice (or use alternatives such as flat rocks if there aren’t other options available at the time). You need to watch that the sharpening stone you are using (there are a couple of different types of sharpening stones and tools) is the right choice for your knife, also making sure that your knife is being sharpened under the right angle. For tips and tricks on how to sharpen your knife, see our article on this important topic. To help you out with making your mind about the best product, we have compiled a list of some of the most popular and possibly the best knives that fit your pocket on the market. 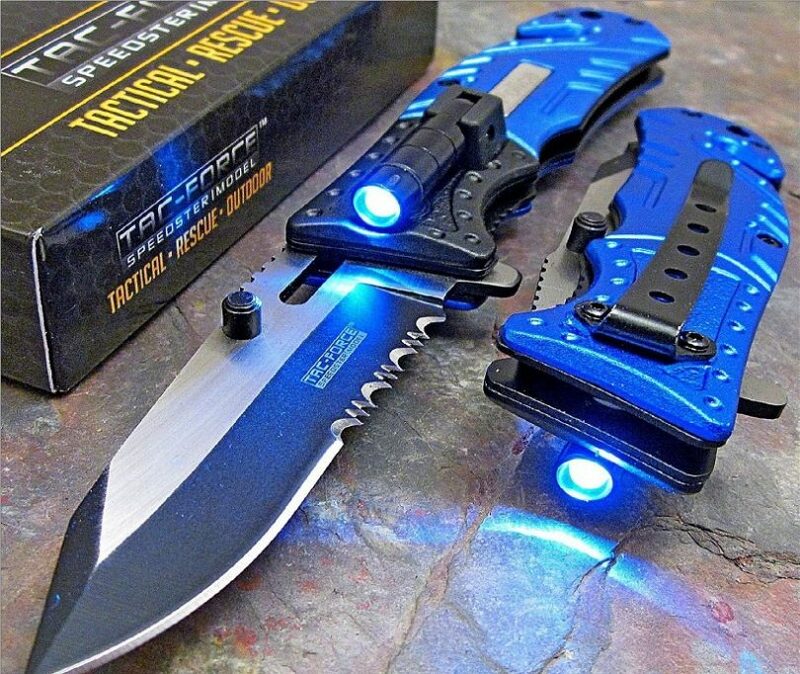 This knife is one of the most popular tactical knives available. Not only because its price is pretty affordable and fairly low but also for its design. 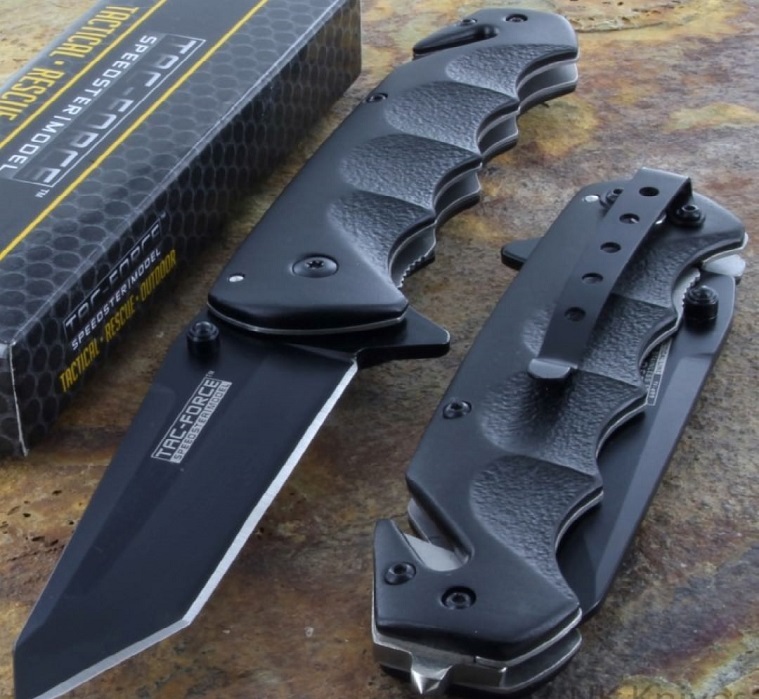 TAC Force tactical knife has a serrated blade and it has an ability of easily being folded. The knife has a liner lock so you could use it safely without handling your knife with accidental cuts. It has built in spring mechanism that helps the knife fold back and forth almost effortlessly. The knife is made to be highly functional and always ready to be used thanks to its folding mechanism – it is made to enable one hand operation even when opening and folding. The handle is made of high quality aluminum and it comes with two handy accessories. 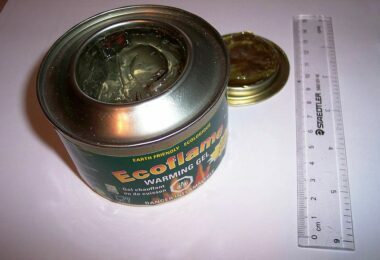 One of the accessories is a can opener – you will surely love this if you are packing up your lunch in cans (for bug out plan or camping). The other accessory available on the handle is a glass breaker. This accessory can help you greatly in case of emergency (if you need to escape and glass is the only thing preventing you from doing so). The blade is 3mm thick and 3 ¼ inches long (check for regulations in your country for this length), so the blade is fairly thick and suitably long. The knife also comes with a clip so you could carry it around safely without losing it. All in all, this is a very decent knife with great potential that has everything or almost everything you need. Who doesn’t like to hear this name when picking out tactical tools and weapons? Smith and Wesson surely make you leave all your doubts behind. The same goes for their pocket knife. This is a classic little knife behind a big name. The product comes with a thumb knob and liner lock – both features allow you to open the knife easily and safely without much effort. So, just as the first knife we have reviewed this one has a mechanism that enables you to operate with the knife with only one hand. The blade is partially serrated and 3.1 inches long. It is made of stainless steel for flawless performance and long lasting life time. The handle is black and made of aluminum. There is also a clip available for safe and secure carrying. There are no additional features, but you are choosing quality and endurance with this blade. When you take a look at this knife you may think that this is the weapon of choice of police officers and rescue units. No wonder, as its looks depicts exactly what this pocket knife represents. The knife looks great, but are there other things that make it great? Yes, we believe so. One of the most useful things to find on it is the LED flashlight on the back of the handle. 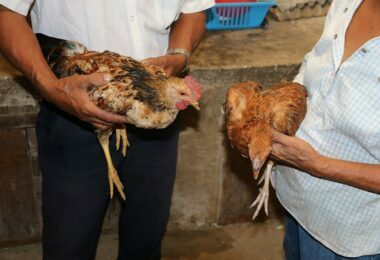 The handle is made to feel comfy in your hand, so it is designed to be ergonomic. The blade is 4.5 inches long so this is a large knife that requires locking. This is a heavy duty knife with ability to cut through strong materials. That ability makes it perfect from cutting rope or cutting a seatbelt if you are endangered and stuck – that justifies its quality as a rescue pocket knife. 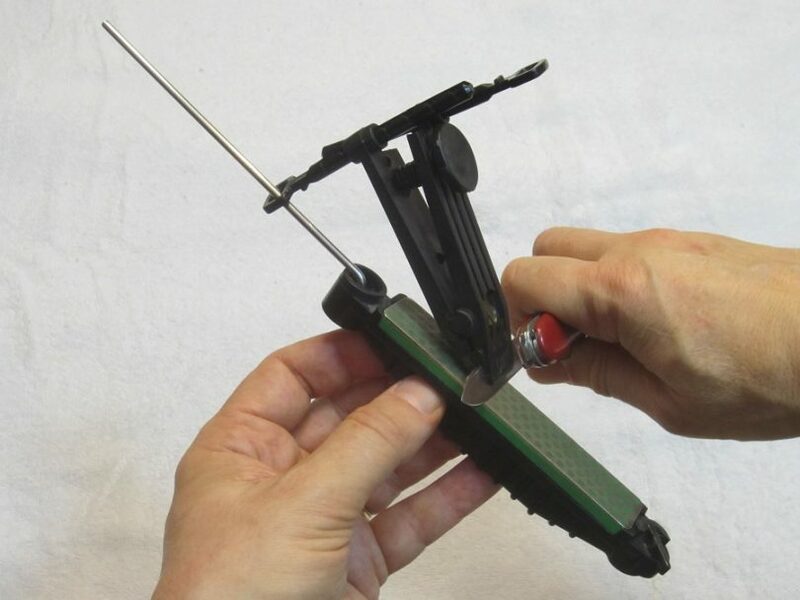 The knife has a spring supported mechanism that allows you to open it quickly operating with only one hand – pretty simple and easy to use. Besides the LED lamp, you have a glass breaker included, also great for emergency situations. With thins knife you just know you are prepared for anything that can happen. It comes with a clip for safe and secure carrying. Make sure this knife is legal in your country before purchasing it. Here is another one of the bestselling products on the market. The price is fairly low, which makes this knife quite affordable. Don’t be fooled by its low price as you are getting yourself a solid good investment. On the first look, we have a smooth and sophisticated knife, but this knife is made to help you survive SHTF scenarios easily. What adds the smooth look is the handle which is made out of Pakkawood and it just looks smooth and sleek. The pocket knife has a liner lock that enables you to handle the knife safely without accidentally cutting yourself when opening it. It is supported by spring mechanism which allows you to effortlessly open the knife with a single press and with using only one hand. 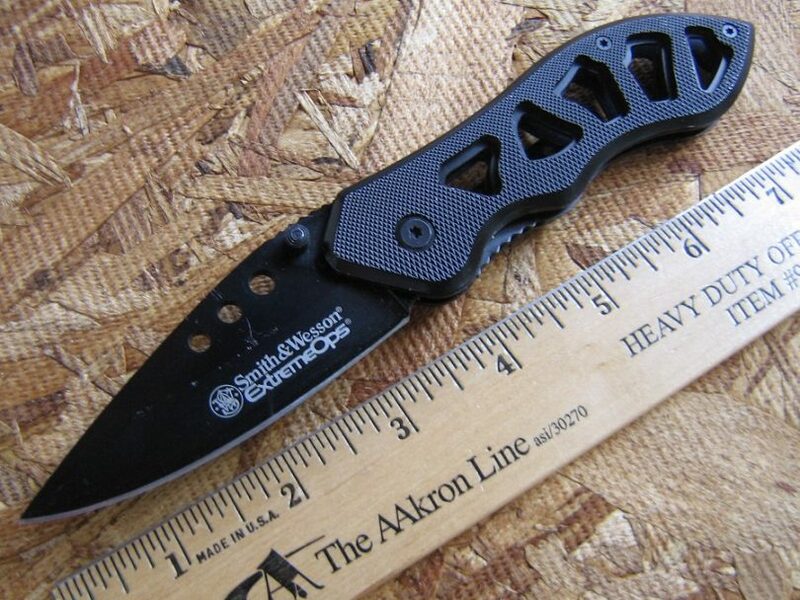 There is no serrated parts on the blade unlike past few pocket knives we have reviewed. The blade is straight, black and made of stainless steel for prolonged life and improved resistance. The blade is 3 inches long with 3 mm thickness. It comes with a clip for safe carrying. 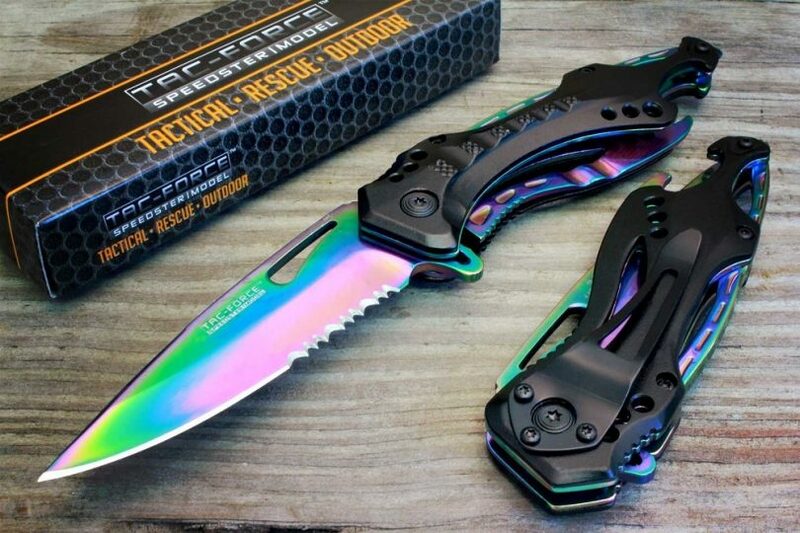 This TAC’s knife is one of their many fine products with some changes added to have it differentiate from their other products. You’ll realize that from the first time you notice the ring handle. The ring handle is available at the end of the handle and it is meant to help you have a more secured grip when using the knife. Half of the blade is serrated which is suitable for cutting through demanding strong materials – this can save your life in many potential SHTF scenarios. You can use i6t for cutting rope as well, which will come in as handy when camping and making your own shelter. The length of the blade is 3.25 inches and overall length of the knife is doubled. The handle is made of high quality aluminum and the blade is made of stainless steel. 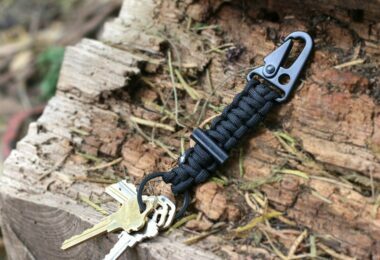 This is a good combination as it guarantees a long lasting pocket knife. There is also a clip available for safe carrying. The blade has a thumb stud which makes opening very easy, with one hand operation enabled that way. Liner lock is added for safe handling and prevention of accidental cuts. 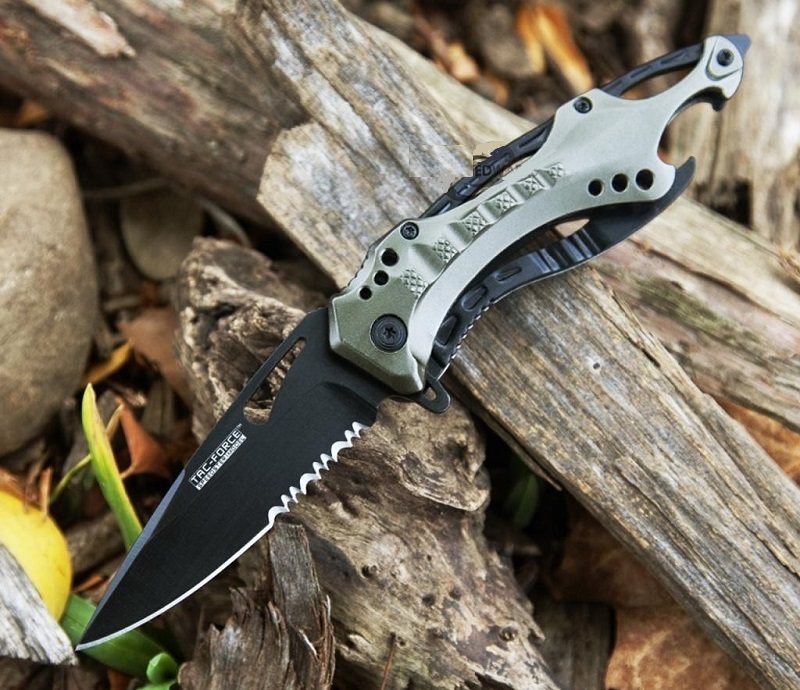 To know how to choose the best tactical knife for you needs, see our must-read article on this. 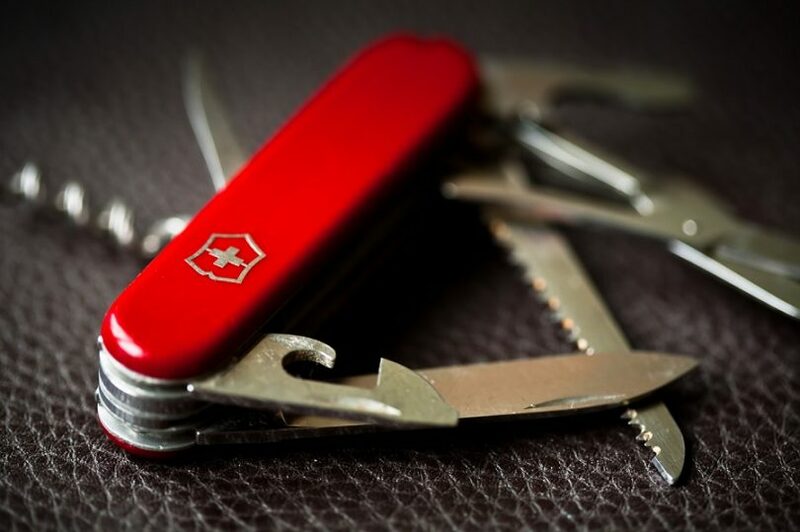 We can’t end our list without mentioning an evergreen classic among multi tools and pocket knives: the Swiss Army Pocket Knife. This isn’t just any Swiss Army Knife – this is THE Swiss Army Knife. They have slightly changed the handle, making it translucent for smoother looks. Other than that, you have everything you could ever have in such a small knife designed about 100 years ago. Manufacturers guarantee that you are buying this knife for an entire lifetime as well as that it will never fail you. All tools are made of stainless steel for improved strength and resistance so you can trust that everything will be done smoothly. The knife comes with a small blade (which is perfectly legal), mini scissors, tip of a screwdriver, key ring, tweezers and a toothpick. All the tools are designed to fit smoothly into the frame and can help you a great deal as a part of your bug out bag or camping gear. Here’s our review of the best Swiss Army knives to give you more options. The Swiss Army pocket knife is a truly handy thing to have around, but you should know that it is not made for heavy duty operations. That is why we recommend you to have a spare. There are many potential SHTF scenarios where a pocket knife could come as a life saver. That is the reason you need to choose it wisely. Think of everything you were planning on doing and find matching features among our top picks – you might just find the best knife for your pocket. See our experts’ tips and guide to the best survival knife to help you in any situation.